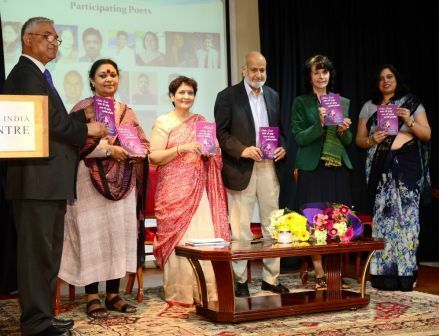 The Nehru Centre, London, July 28, 2016: the Vatayan launched its fourth anthology of poems, Native Scents/Watan ki Khushboo (Editor: Divya Mathur, Co-editor: Dr Hilal Fareed, Interviews: Shikha Varshney) in the presence of Ruth Padel, British poet and writer with close connections to conservation, wildlife, Greece and music. In chair was Dr MZA Shakeb, historian and Chairman, Ilmi Majlis-London, who also reviewed the book, which has been part funded by the Big Lottery Fund for Languages & Linguistics. Ms Divya Mathur, Founder of Vatayan, introduced the programme - a multilingual, multicultural and multidimensional bonanza. She said that poetry has always had a limited readership; it is fiction that sells but at present, there is no cause for despair, as some prominent publishing houses are publishing poetry now and various websites have widened its reach and if nothing else, it has a therapeutic value. Dr Hilal Fareed, author and founder of Sir Syed Foundation, compered the programme brilliantly. Launching the book, Ruth Padel, said that a variety of poetry is not only attractive; these verses will help young generation to appreciate the good and bad of their homeland and to the west to have a taste of the orient. Dr MZA Shakeb said that the poetry of the immigrant poets reflects diverse elements such as their nostalgia, sometimes appreciation of new values and sometimes annoyance with the change. They seem to be very firm in holding the value of love and spirituality. Uttara Sukanya Joshi sang Dr Gautam Sachdev's ghazal followed by Lalit Mohan Joshi, who paid a tribute to the two great Hindi scholars we have lost in the recent past - Dr Satyendra Srivastava and Dr Gautam Sachdev; this anthology is dedicated to both of them. Sushma Mehta, Kathak dancer and choreographer, performed Akbar Hyderabadi's ghazal, Zindaan-e-subho shaam mein' and Mehtab Malhotra sang Usha Raje Saxena's ghazal, 'Samandar mein utarna aa gaya hai,' which is included in Vatayan's album composed and sung by the well known singer Radhika Chopra. Dr Vayu Naidu, Diana Mavroleon, Shelley Williams, Neelum Singh and Arun Sabarwal recited English translation alongside the Hindi and Punjabi poets - Shail Agrawal, Pran Sharma, Jai Verma, K C Mohan and Jagtar Dha. Translators include Chaand Chazelle, Rogan Wolf, Dr Pavan K Varma, Dr MZA Shakeb, Julia Casterton, Jutta Austin, Lalit Mohan Joshi, Dr Saif Mahmood, Shelley Williams, Neelum Singh, RK Agnihotri, Paras Anand, Bhupinder Parihar, Beryl Dhanjal, Zahra Sabri, Syeda Hameed, Amina Yaqin, Francis Pritchett, Rafey Habib, Brenda Walker and Divya Mathur. The audience was full of connoisseurs of poetry, authors, translators, artists and media personnel including Viram Jasani, founder of Asian Music Circuit, Yogesh Patel, Editor, Word Masala, Editor of Health Happiness, Vijay Rana, Urdu scholars Javed Sheikh, poet Yashab Tamanna, founder of FAB Book Club, Uma Malhotra, broadcaster Mamta Gupta, educationist, Aruna Ajitsaria, amongst many others. The programme was covered by MA TV. Mira Kaushik, Chair of Vatayan and Director of Akademi, welcomed Mr Tarun Kumar, Attache (Hindi & Culture), who has recently joined the High Commission of India and expressed that, as far as promotion of Hindi and Indian languages are concerned, the two organisations should collaborate.